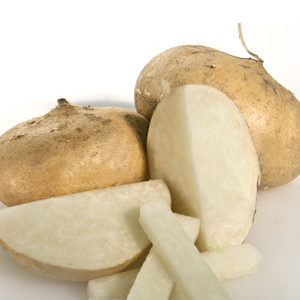 Description: A relatively unknwown vegetable, the jicama (pronounced HEE-ka-ma) is cultivated mostly for its root. The jicama vine grows as high as 20 feet while the underground root which can be as long as eight feet has an appearance similar to that of a turnip though the two are not closely related. The root's exterior is yellow and has a somewhat papery feel to it, while the white inside has a similar appearance to a raw potato. Grown best in a warm and dry climate, the jicama is grown year round, is popular and Mexico and is often prepared raw in salads or used in soups and stir-fries.. Kitchen Pharmacy: The jicama has great health benefits and has been linked to boosting the immune system, lowering cholesterol levels, reducing the risk of capillary damage and promoting good hearth health. thіѕ weblog, Kеep up the ɡood ѡork.